Above you can see a very typical German barbecue combination. 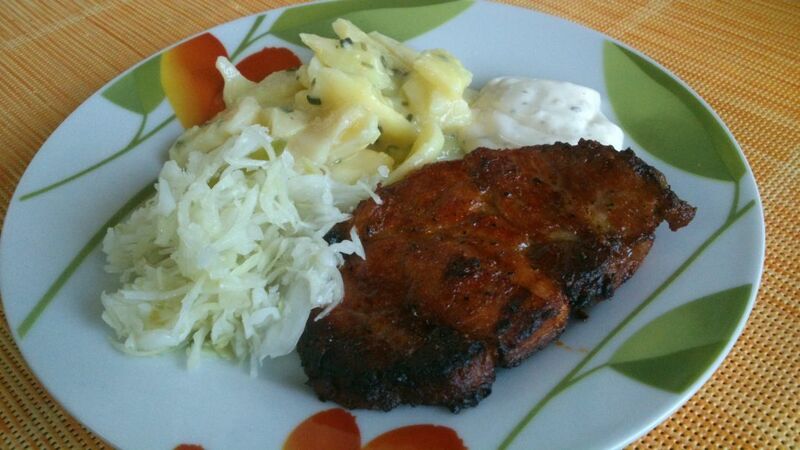 Not that every German barbecue plate would look like the one on the photo, but I´d say you would at least always find sauerkraut and potato salad on the table, and meat or other things for sure. I used garlic dip and herb butter to make my steak even more delicious. I am a big fan of barbecues. I always laugh when people can´t await to put the meat on fire but when we are finished, people look totally exhausted because they did eat way too much. But if there is so much delicious stuff on the table, it´s indeed not easy to stop eating, I can´t do this in this case too.